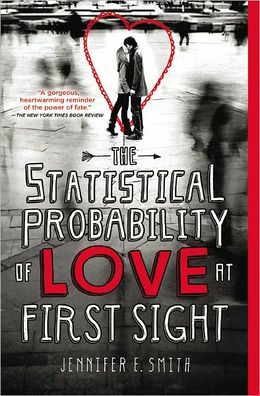 The Statistical Probability of Love at First Sight by Jennifer E. Smith is simply a delight! This tale takes place over a twenty-four-hour-hour-period, is fast paced, and nearly impossible to put down. Hadley is having beyond the worst day. She misses her flight to London, where she is headed to attend her father’s wedding, and she’s never even met the bride! So not only is Hadley already super cranky about having to go to her father’s wedding (when she feels so betrayed by him for being so void in her life and moving to London in the first place), but now she is stuck at the JFK airport, waiting for the next available flight, which will put her arriving in London with not a minute to spare. While waiting for the next flight, she meets Oliver. He’s British, incredibly cute, and going to college in the U.S. Call it fate, call it happenstance, call it a coincidence, call it whatever you like, but something brought these two together again, putting them sitting next to each other on the long plane ride to the UK. Over the course of the 7 hour trip, the two strangers get to know one another, talking about everything under the sun, and even divulging things they have never told another soul. Is it completely insane to fall in love with someone you don’t even know? Probably, but that doesn’t mean it can’t happen. This pulse pounding and heart-wrenching Teen novel with have you believing in the miracle of love and hope again. I guarantee you will be cheering these two young protagonists on, just as I did! I give this quick and fun read four stars! …seriously, people: Le Sigh, and also, Eeeeeap!